Dedicated to ending discrimination based on sexual orientation and gender identity. Founded in 1993, the Human Rights Council of North Central Florida (HRCNCF) works to end discrimination based on sexual orientation and gender identity in the interest of civic betterment and social welfare. HRCNCF also seeks to work in coalition with other organizations to end discrimination based on race, gender, socioeconomic status, age, religion, national origin, or disability. The Human Rights Council of North Central Florida has been your Hometown Equality Advocate for LGBT rights since 1993 – leading the fight for Gainesville's conversion therapy ban (2018), for Alachua County sexual orientation and gender identity protections (2013), Gainesville gender identity protections (2008), domestic partner registry (2007), domestic partner benefits for city employees (1999), and sexual orientation protections (1998). HRCNCF continues to conduct candidate questionnaires and forums to keep you informed where local candidates stand on LGBT issues. Gainesville Election Day is Tuesday, March 19. 1. Vote by Mail: Call the Supervisor of Elections office at 352-374-5252 and ask them to mail you a ballot. 2. Vote Early from Saturday, March 9, to Saturday, March 16 at the following voting sites: the Supervisor of Elections office, 515 N. Main St., the Senior Recreation Center, 5701 NW 34th Blvd., the Millhopper Library, 3145 NW 43rd St., the University of Florida J. Wayne Reitz Union, and the M.L. King Jr. Center, 1028 NE 14th St."
3. Vote on Election Day: At your assigned polling precinct on Tuesday, March 19, from 7 AM to 7 PM. Check out the latest issue of our newsletter, the Guardian, which includes full responses from candidates appearing on the March 19 Gainesville election ballot. HRCNCF Board of Directors meets every second Thursday of the month at 7:00 PM at Pride Community Center of North Central Florida, 3131 NW 13th Street, in Gainesville. Everyone is welcome to attend. Donate to HRCNCF and Become a Member Today! 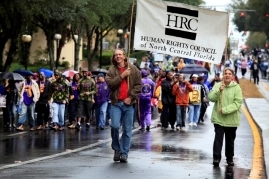 HUMAN RIGHTS COUNCIL OF NORTH CENTRAL FLORIDA, INC.